Partly cloudy. High 73F. Winds NNW at 10 to 15 mph.. The Annual Easter Egg Hunt on the Oval at Stratford Hall is set for April 20. 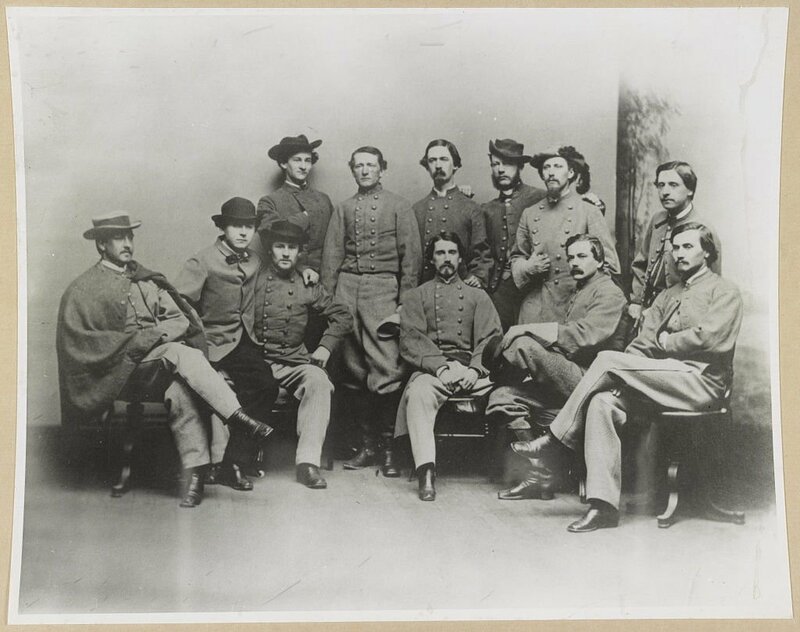 Donald Hakenson will speak about Col. John Singleton Mosby, pictured here with members of Mosby’s Rangers, 43rd Virginia Cavalry Battalion, in Culpeper on April 26. The Lake of the Woods Veterans Organization Color Guard will take part in a memorial ceremony May 25 at Ellwood. Living History Weekend at Spotsylvania Battlefield will take place June 22 from 10 a.m. to 5 p.m. and June 23 from 10 a.m. to 3 p.m. near the Bloody Angle site (Stop No. 3) on the Spotsylvania Court House battlefield. Special programs about the Battle of Spotsylvania Court House, including both marching and musket-firing demonstrations, will occur throughout the weekend. Email information to tandc@freelancestar.com (subject: History Calendar). For more listings, see fredericksburg.com. “The Cool Kids of Dahlgren.” April 17 at the UMW–Dahlgren Campus, 4224 University Drive, King George. Reception begins at 4:30 p.m.; program begins at 5 p.m. Meet some of the young guns of Dahlgren developing cutting-edge technology for the war-fighter during this presentation, which is part of the Dahlgren Heritage Museum Speaker Series. This event includes an interactive STEM event for kids before the program. It is free and open to the public. “Loyalists in Virginia.” April 17 at 6:30 p.m. at Central Rappahannock Library Headquarters theater, 1201 Caroline St., Fredericksburg. Author Travis Shaw will speak at the American Revolution Round Table of Fredericksburg. Free; light refreshments. Contact Jim Davis at JamesDavisW@aol.com or 540/899-3836. Burgandine House Remembrance Days. April 19–21 at 807 South Main St., Culpeper. To mark the 155th anniversary of Gen. Grant’s Union occupation of the area, there will be an encampment, Gen. Grant and Union Army living historians, cooking demonstrations and games. The event will be held Friday from 10 a.m. to dark; Saturday from 9 a.m. to dark; and Sunday from 10 a.m. to 5 p.m. The unveiling of the Historic Register plaque will be at 2 p.m. Saturday. Free, but donations appreciated. 540/718-4941; shimmergloom2@hotmail.com. Fit-History Hike: Ecology of The Wilderness. April 20 at 10 a.m. Join ranger Becca Jameson on a hike through the Wilderness Battlefield and listen to what nature tells us about the area’s history. Participants of this 2.5-mile hike, sponsored by Fredericksburg & Spotsylvania National Military Park, should meet at Hill–Ewell Drive Picnic area between Tour Stops No. 3 and No. 4 at Wilderness Battlefield. nps.gov/frsp/planyourvisit/hiking.htm or 540/693-3200. Annual Easter Egg Hunt on the Oval at Stratford Hall. April 20 from 10 a.m. to 1 p.m. (Easter Egg Hunt begins at 11 a.m.) Children will be grouped by age from 2 (accompanied by parents) to 12. Bring a basket or other container. Plan to enjoy hot dogs, cupcakes and drinks. Admission to the Stratford Hall grounds, the hunt and refreshments are free. For information, contact Jon Bachman at 804/493-1972 or Jbachman@stratfordhall.org. Gen. Washington in Spotsylvania. April 21 from 5–8 p.m. at historic Snow Hill Farm. The Spotsylvania Historical Association and the Spotsylvania County Museum will sponsor an evening under the stars featuring food, drink and political discourse. “Gen. Washington” will be available for questions and photos from 5–5:45 p.m. Dinner will be served at 6 p.m. and includes a presentation. The buffet-style dinner is being catered by Country Lane Catering. Lake Anna Winery will provide a cash bar. Tickets are limited and are $40 per person. They can be purchased at spotsylvaniahistory.org or the Spotsylvania County Museum, 9019 Old Battlefield Blvd., Suite 100. Tickets are on sale through April 14. For sponsorship details, email info@spotsylvaniahistory.org. Talk on the 1861 Peace Conference. April 24 at the University of Mary Washington Jepson Alumni Executive Center, 1119 Hanover St., Fredericksburg. Writer and historian Mark Tooley will speak to the Civil War Round Table of Fredericksburg. Doors open at 5:30 p.m., bar opens at 5:45 p.m., dinner at 6:30 p.m. Program starts about 7:30 p.m. with questions afterward. Dinner is $32 cash or check at the door. Reservations required by April 19 at 540/361-2105; call in any cancellations. For details, email cwrtf@cwrtf.org or go to cwrtf.org. Brandy Station Foundation annual meeting and fundraiser. April 26 from 6:30–10 p.m. at Best Western Culpeper Inn, 791 Madison Road. Donald Hakenson will speak on “Mosby Comes to Culpeper.” He will talk about the capture of Union mapmaker Robert Knox Sneeden on Fleetwood Hill and bring his books for purchase. There will be a buffet-style dinner and a silent auction. Cost is $30 per person. Reserve by April 17 by contacting Bob Jones at 540/399-1702 or bsfjones@gmail.com. brandystationfoundation.com. Civil War Study Group at Lake of the Woods. April 26 at 10:30 a.m. National Park Service historian Frank O’Reilly will speak about the contributions made to Lee’s victory at Fredericksburg by William Barksdale, a maverick Confederate officer from Mississippi. Open to the public. civilwarstudygroup.org. Garden Week 2019. April 27 through May 4 at 1200 Charles St., Fredericksburg. The gardens of Mary Washington House will be open and free to the public during regular museum hours throughout Garden Week. washingtonheritgemuseums.org. Annual Plant Sale. April 27 from 9 a.m. to noon at the Mary Washington House, 1200 Charles St., Fredericksburg. The sale features dozens of varieties of perennials, including varieties from the gardens of the Washington Heritage Museums. washingtonheritagemuseums.org. Spring Open House at Melchers Home and Studio. April 28 from 1–5 p.m. at 224 Washington St., Falmouth. The public is invited to tour the house, studio and galleries of the famous American painter Gari Melchers. Stroll the restored gardens and woodland trails, visit the Fannie Roots House on the property to hear about the latest restoration efforts, join a Preschool Palette class in the kitchen classroom and explore the museum shop. St. James’ House Spring Opening. April 29 through May 4 at 1300 Charles St., Fredericksburg. Visitors can tour the St. James’ House during its spring opening to see its collection of antiques and decorative arts. Admission is $5 per person, free for members. washingtonheritagemuseums.org. “Preserving Family Heirlooms.” May 2 from 10–11 a.m. in the theater room at Central Rappahannock Regional Library in Fredericksburg. Jarod Kearney, assistant director and curator of James Monroe Museum, will present during this event that’s part of the Washington Heritage Museum’s speaker series. washingtonheritagemuseums.org. Charles Washington’s Birthday and Lawn Games. May 4 from noon to 4 p.m. at Rising Sun Tavern, 1304 Caroline S.t, Fredericksburg. Celebrate Charles Washington’s birthday with a tour of his home, lawn games in the garden and cupcakes. The event is included with the cost of admission. washingtonheritagemuseums.com. 50th Garden Anniversary Celebration. May 4 from 11 a.m. to 4 p.m. at Mary Washington House, 1200 Charles St., Fredericksburg. The event marking the 50th anniversary of the Mary Washington House garden will include period-costumed volunteers, refreshments and an exhibit featuring photos, postcards, paintings and Garden Club memorabilia. The exhibit will be open weekends through May. Regular admission to the museum and exhibit is $7 for adults and $3 for students and children. WHM members will receive discounted admission of $5 for adults and $1 for students and children. washingtonheritagemuseums.com. Fit-History Hike: Chancellorsville History Trail. May 4 at 10 a.m. Take a hike on one of the park’s most popular trails with historian John Hennessy. Learn about the struggles of soldiers and civilians alike in the tangled wooded landscape. Participants of this 4.3-mile hike, sponsored by Fredericksburg & Spotsylvania National Military Park, should meet at the Chancellorsville Visitor Center, 9001 Plank Road, Spotsylvania. nps.gov/frsp/planyourvisit/hiking.htm or 540/693- 3200. The 155th Anniversary of the Battle of the Wilderness. May 4 and 5. Friends of Wilderness Battlefield will host a living history event featuring opprtunities for the public to interact with living historians who portray participants in the battle, including Union Gen. Ulysses S. Grant; Army commander George G. Meade; one of the Army’s infantry corps commanders, Gouverneur K. Warren; and Union Cavalry Corps commander Philip H. Sheridan. Living historians representing President Abraham Lincoln, Secretary of War Edwin Stanton and Grant will replicate a Council of War held in March 1864. This vignette will occur at 1 p.m. and possibly other times throughout the day. At 10:30 a.m. and 2 p.m., visitors can participate in “military maneuvers” using wooden “muskets” as they march beside the living history soldiers. There will be a display on observation balloons used during the Civil War to gather intelligence on enemy troop dispositions and movements. Friends of Wilderness Battlefield interpreters will conduct a guided walking tour of the Wilderness Crossing Trail at 3 p.m. both days. A 30-minute walking tour of the grounds will be offered at noon, as well. A full field hospital will be on the grounds, and a living historian portraying a Civil War surgeon will be in the Ellwood Manor a circa-1790 hosue within the Fredericksburg & Spotsylvania National Military Park. The Spotsylvania Civilian Corps will re-create what civilian life was like at the time of the battle. Ellwood will be open from 10 a.m. to 5 p.m. The event is free and open to the public. fowb.org. “Ex Uno Disce Omnia: The Wartime Experience of Orson W. Bennett.” May 13 at Brock’s Riverside Grill on Sophia Street in Fredericksburg. Washington and Lee alumnus and Radford University instructor Geoff White will speak during the Rappahannock Valley Civil War Roundtable’s monthly dinner meeting. Social time begins at 5:45 p.m.; dinner at 6:45; speaker at 7:45. The talk is free, public invited. Reservations required for dinner and cost $25 for members, $30 for nonmembers. For dinner reservations, email cwrtdinner@yahoo.com or call 540/399-1702. rvcwrt.simdif.com. Fit-History Hike: Spotsylvania’s Bloody Angle. May 18 at 10 a.m. Join historian Britt Brewer to explore the fighting at the Bloody Angle and Lee’s second line. Participants of this 3-mile hike, sponsored by Fredericksburg & Spotsylvania National Military Park, should meet at Tour Stop No. 3, Spotsylvania Battlefield. nps.gov/frsp/planyourvisit/hiking.htm or 540/693-3200. Rappahannock Valley Civil War Roundtable bus tour. May 18. The bus will depart the Gordon Road commuter lot at 7:30 a.m. and return at 6 p.m. The tour will include stops at “Lee’s Lexington and Jackson’s Homestead” in the VMI Museum, Jackson’s Cemetery and the Lee Chapel and Museum, Jackson’s Cemetery and the Lee Chapel and Museum in Lexington. The cost for those registering before May 5 is $80 for members and their guests and $100 after May 5. The cost for nonmembers is $100. That cost includes bus, lunch at Palms at Lexington, site fees and guided tours. For more information, contact Bob Jones at cwrtdinner@yahoo.com, Bobnpeg1954@gmail.com or 540/399-1702. rvcwrt.simdif.com. Reading Lee with Dennis Fry: Lee’s Great Expectation of 1862. May 22 from 7–9 p.m. at Central Rappahannock Regional Library Headquarters Theater, 1201 Caroline St., Fredericksburg. The talk is free to the public. The lecture will last about an hour and will be followed by a question-and-answer segment. Seating is limited; plan to arrive when the doors open at 6:30 pm. stratfordhall.org/events/reading-lee-with-dennis-frye. For more information, contact Jon Bachman at 804/493-1972 or JBachman@StratfordHall.org. Luminaria. May 25 at 6 p.m. at Fredericksburg Confederate Cemetery, 1100 Washington Ave. Guided cemetery tour by Dan Janzegers; closing salute volley from SCV Matthew Fontaine Maury Camp. Hosted by the Fredericksburg Ladies Memorial Association. Memorial Day Weekend Luminaria at National Cemetery. May 25 from 8-11 p.m. Local Scouts will light 15,300 candles at Fredericksburg National Cemetery—one for each soldier buried there. In addition, a bugler will play “Taps” every 30 minutes during the evening, and park staff posted throughout the cemetery will tell stories about some of the soldiers. In the event of rain, the event will be moved to May 26. The cemetery is located at the intersection of Sunken Road and Lafayette Boulevard; however, those wishing to attend the luminaria may park at the University of Mary Washington lot at the corner of William Street and Sunken Road. The Fredericksburg Trolley will provide shuttle service between the parking area and the national cemetery. 540/693-3200 or nps.gov/frsp. Memorial Day Ceremony at Ellwood. May 25 at 2 p.m. at 36380 Constitution Highway. A program on Ellwood’s grounds will honor Civil War soldiers who gave their lives on the Chancellorsville and Wilderness battlefields. The program will begin with the presentation of the Colors by the Lake of the Woods Veterans Club. An invocation will follow. Park Supervisory Historian Greg Mertz will then give a talk reflecting on the legacy of Confederate Gen. “Stonewall” Jackson, whose arm was amputated at a nearby field hospital and later interred in the Ellwood family cemetery. The program will conclude with a tribute to the soldiers who were buried on the battlefield and later moved to local cemeteries. The Daughters of the Confederacy will place symbolic flowers to honor the dead from both Union and Confederate armies. The program will end with the playing of Taps. The program will last about one hour. 153rd Memorial Day Ceremony. May 27 at 10 a.m. at Fredericksburg Confederate Cemetery, 1100 Washington Ave. Robert Epp will present “A Genealogist’s View of the Fredericksburg Confederate Cemetery.” In case of rain, the program will be held at the Crown Shield Building on the grounds of Kenmore, 1201 Washington Ave. Hosted by the Fredericksburg Ladies Memorial Association. Fit-History Hike: Prospect Hill at Fredericksburg Battlefield. June 1 at 10 a.m. Join historian Nathan Varnold for a hike along the elevation change on the southern end of the Fredericksburg battlefield. Learn how terrain, and the slope of Prospect Hill, gave an advantage to the Confederate counterattack Dec. 13, 1862. Participants of this 3.5-mile hike, sponsored by Fredericksburg & Spotsylvania National Military Park, should meet at Tour Stop No. 6, Fredericksburg Battlefield. nps.gov/frsp/planyourvisit/hiking.htm or 540/693-3200. Cutting Edge of Technology—Moving Innovation. June 19 at UMW–Dahlgren Campus, 4224 University Drive. Reception begins at 4:30 p.m.; program begins at 5 p.m. Learn more about the technology being developed at Naval Support Facility Dahlgren and its deployment at this presentation, which is part of the Dahlgren Heritage Museum Speaker Series. This event is free and open to the public. Living History Weekend at Spotsylvania Battlefield. June 22 from 10 a.m. to 5 p.m. and June 23 from 10 a.m. to 3 p.m. near the Bloody Angle site (Stop No. 3) on the Spotsylvania Court House Battlefield. Visitors, who will be able to interact with re-enactors, will receive an identity card containing information about a soldier who fought in the battle. Special programs about the Battle of Spotsylvania Court House, including both marching and musket-firing demonstrations, will occur throughout the weekend. Visitors are encouraged to stop by the Spotsylvania Court House Battlefield Exhibit Shelter at 9550 West Grant Drive to obtain a map and directions to the program locations. The event is free and open to the public. nps.gov/frsp or 540/693-3200.